Autumn is right around the corner and for gardeners, this means winter is not too far behind. As winter begins to get closer and the temperature begins to slowly drop it’s important to take action now to prepare your garden for the colder months that lie ahead. To keep your garden from becoming a casualty of the winter season, follow these simple tips to stay ahead of the cold so that your garden flourishes in the spring. Once you realize the days are slowly becoming shorter, it’s time to anticipate the first frost. 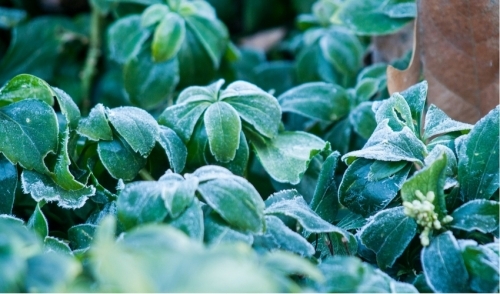 Make sure that your garden is prepped for winter before the first frost hits. Once the frost hits, everything you worked for over the summer will be ruined. Begin by weeding your garden. Now that’s its September, you probably haven’t been showing your garden as much love as you used to. Most gardeners tend to get a bit lazy during the fall. That’s right, you all know who you are. Get the grunt work done now or you’ll have twice as much to pull out later when it’s colder outside and even more work to do the following spring. Pull weeds, clear any debris, and rake dead leaves so that they don’t suffocate other plants in your garden when they become damp and heavy. Be sure to compost any dead leaves around your garden and lawn to be used later the following year. This will give you nutrient rich soil for your perennials and annuals to grow. Another tip is to lay down mulch. Laying down a layer of mulch can be very beneficial for your garden. Mulch is not just for decoration around your bushes in your front yard. It’s also a natural protector for your garden bed when the ground freezes over in the winter. It keeps the ground from becoming too cold or drying out destroying any bulbs you may have left for spring. Another important tip to prepare your garden for winter is to pull your annuals and cut back your perennials. This will not only tidy up your garden, but it will also help the plants grow back stronger. Furthermore, if you are really lucky, your annuals will unexpectedly leave behind seeds that might grow back naturally in the spring. Even though your evergreens can withstand the cold, they too may also need attention to avoid becoming brittle and dying during the coldest of winter months. Many people often wrap their evergreens in burlap to protect them from the snow and ice. Finally, once you have cleaned your garden and successfully prepped it for winter, plant spring bulbs. Winterizing your garden is not just about cleaning and raking; it’s about preparing for months that lie ahead so that your plants flourish in the spring. Plant spring bulbs now so that their roots take hold within the dirt and when the weather warms up, they are ready to sprout from the earth and soak up the sun. Follow these simple tips to prepare your garden for the colder months ahead so that your garden awakens healthy and ready next spring.